A Poway couple, found with almost 200 Yorkie dogs inside their homes and a restaurant were sentenced Tuesday. Christine Calvert, 62, and Mark Vattimo, 73, were placed on three years of felony formal probation for animal neglect. As part of the sentence, they were ordered not to have dogs for 10 years, said prosecutors. Calvert was also ordered to continue counseling. In January, the Humane Society received a report from a concerned veterinarian that suggested the Poway couple was keeping 180 dogs in deplorable conditions. The dogs were kept in dark, unsanitary rooms filled with feces, urine, and mice at the defendants’ homes. The couple was charged with 10 felony counts, including animal abuse and neglect, and one count of resisting an officer. Calvert and Vattimo previously pleaded not guilty in March, and later switched to guilty pleas. The felony could be reduced to a misdemeanor, according to Superior Court Judge Kathleen Lewis. The couple could apply to have animals within five years if that happens. Deputy DA Karra Reedy wanted to make sure the public is aware that many of the adopted dogs still have health issues including tumors and behavioral issues. Their motorhome was given to the San Diego Humane Society as restitution. It was purchased last January for $82,000, said the defense attorney. It was unclear why the couple kept so many dogs in terrible conditions, Reedy said. All the animals had health problems, ranging from ear infections to severe matting. The dogs were placed in the care of the San Diego Humane Society. 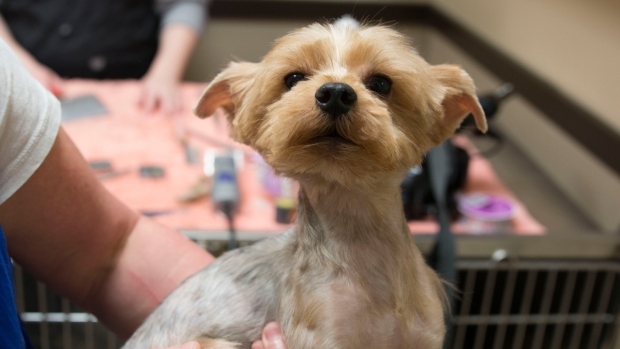 More than 1,500 adoption applications were submitted for the Yorkies, prompting the organization to close the adoption process earlier than planned. One woman who adopted one of the dogs was in court. She told NBC 7 that all she wanted was for the couple to not be able to have animals again. Ed. Note: A previous version of this article incorrectly stated the name of a defendant. The article has been corrected. We regret the error.